Dual textured cat treats irresistible to cats. Deliciously crunchy on the outside, soft on the inside. Only 2 kcal in every cat treat. 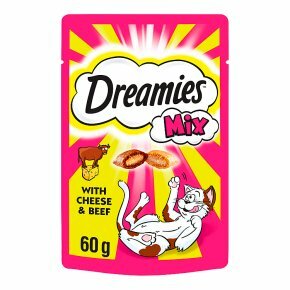 DREAMIES? are available in 5 deliciously tasty combinations: with chicken and duck; with salmon and cheese; with cheese and beef; with salmon and tuna; with chicken and cheese#. Cat biscuits with vitamins and minerals and no artificial flavours.Cats go mad for the irresistible taste of DREAMIES? cat treats. So DREAMIES? Mix combines two great flavours in one bag. Deliciously crunchy on the outside, soft on the inside. We've jam-packed lots of the yummy things cats' love into these tasty treats. So go on, give the bag a shake and watch your cat come running. Cats go mad for the irresistible taste of DREAMIES?. So we've decided to go a little crazy too. Introducing Mix, two great flavours in one bag.